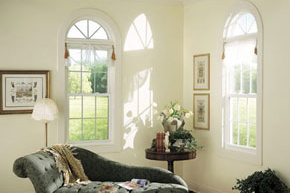 Curves, angles, arches, circles, ovals, octagons—Window World offers them all. These fixed glass geometric shaped windows will enhance the architecture of any home and can be standalone or combined with other window styles to create a beautifully unique window! Window World is one of the only custom window companies in the Long Island area to offer custom shaped window manufacturing and installation. Regardless of the geometric style you choose, your home will become more energy efficient, as each of our special shaped windows are available with Low-E energy efficient glass, which can save you up to 24% on monthly energy costs! No maintenance geometric windows from Window World of Long Island are custom manufactured to meet your Long Island area home’s personal style and taste. Replacing your old, drafty windows with Window World’s high quality replacement windows is one of the best home improvement decisions you can make! While saving money on long term energy costs, you’ll also be adding to the property value and overall beauty of your Long Island area home! Whether used alone or in conjunction with other window styles, Picture Windows and Architectural Shapes add drama and flair to any room. Picture windows have no operable sash so the window does not open. Architectural Shapes are frequently used as capstones above a window configuration to accentuate the room height and create brighter spaces. Some shapes like Circles and Ovals are also used as standalone windows to highlight a particular space or dramatic feature. Because of their different shapes and curves, grid patterns vary by style. Air-tight, dual-paned 3/4″ insulated glass unit is the optimum size. Available with SolarZone™ glass for even greater thermal performance. Intercept® U-channel spacer system keeps convection rates low. Window World’s 6500 Series Custom Windows add a unique flair to any room. Every strategically engineered component of the windows work together to bring you high energy efficiency and low utility bills. Custom windows have no operable sash so the windows do not open. Because of this, the windows offer beautiful unobstructed viewing areas. Custom windows give you the opportunity to show your unique style and showcase your personality in your home. Best yet, the 6500 Series windows are covered by Window World of Long Island’s impressive Lifetime Limited Warranty. Considering adding custom geometric shaped windows to your Long Island area home? Contact Window World of Long Island for your free, in-home estimate today!